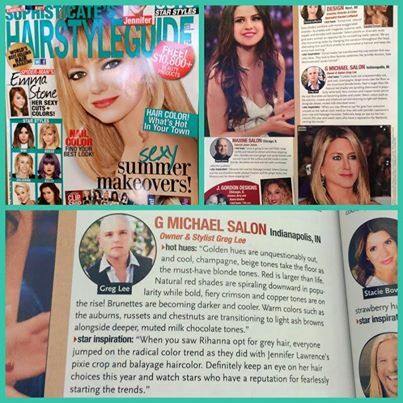 G Michael Salon in Indianapolis, Indiana is featured in the popular publication, Sophisticate’s Hairstyle Guide as an authority on Current Hair Color Trends for 2014. Check it out! Bursting at the seams with excitement this morning as we discovered that G Michael Salon in Indianapolis, Indiana has been featured AGAIN in Sophisticate’s Hairstyle Guide!! Sophisticate’s is the BEST selling Hair Salon magazine in the World and sells more than 2 Million copies per month! We were featured in this article, commenting on what see as some of 2014’s biggest hair color trends! We are so honored to be featured in this magazine for the FOURTH time!!! If you are looking for a cutting edge hair salon in Indianapolis, Indiana to keep you up to date on the latest color trends and haircuts, G Michael Salon is what your locks have been craving! Call us today!